And so… Shinra-Bansho’s third musical has been fully translated! All three of them are dear to me, but I must say, I think the plot in this one is a step above the others, with it emotional moments and sense of scale. (If only we had some dialogue to flesh out the more important things, like how Sanae and Nitori met up again, and stuff like that…) Either way, it makes me look forward to their 4th one even more! Let’s make the flowers bloom, and garnish that grave! Let’s take back the greenery of this great land! Let’s drive away those whispered slanders! So we can live facing only forwards… That’s my job! And so, our narrator closes the book, and looks up at the sky, feeling nostalgia she had not felt in a long time. Where is Nitori now? And what is she doing? This actually raises an important question – who is the narrator? According to a supplementary image provided with the CD, Akyuu is meant to feature somewhere, so I assumed that she was the narrator. Even though Mie voices Marisa as well, her ‘narration’ voice is different to her ‘Marisa’ voice, which lends further weight to this theory. The co-narrator is (probably) Sanae, since Chippo voices Sanae. That girl only believed in tomorrow. She sowed the seeds of flowers. Ended up struggling towards this future. It was not chance. It was not inevitable. I wonder, where is she now, and what she is doing? Still, one thing is for certain: flowers are blooming throughout the world! The babbling riverside has become clear. In a form that everyone would know. In the depths of despair, a friend appears to offer Nitori encouragement. But is this happiness short-lived…? I must say, this is probably the most moving movement out of all 3 of Shinra-Bansho’s musicals. The bit at the end, where Nitori takes over Marisa’s theme, is so symbolic, and so unexpectedly moving as well. As a side note, the title relates to the Japanese version of the idiom ‘there’s no crying over spilt milk.’ I chose a more… literal translation simply because it felt more appropriate, given the tone of this section. Hey, I wonder if I made a mistake somewhere. It wasn’t meant to be this way. Didn’t she say that everyone would smile and be free…? Hey, Marisa. Can I do anything for you, my sworn friend…? So let’s pass the time together from now on, too! No matter how much, how much I regret it, I mustn’t look back. Still, now, at this place, I want you to permit me to make up for my sins! Everything around is ashen, and the sky is dull. Where did that fantasy go…? Was this power… (That forbidden apple) wrong? (We mustn’t get involved.) Was this invention… right? The outside and this fantasy ended up being tied together. I hoped to escape from those eyes. Still, I looked up at the sky. Anyway, some major plot happens in the next part. Please wait warmly until it’s translated. I can’t wait to see what it looks like when it’s finished…! For my sake, for everyone’s sake… look! This is an invention for all of Gensokyo! 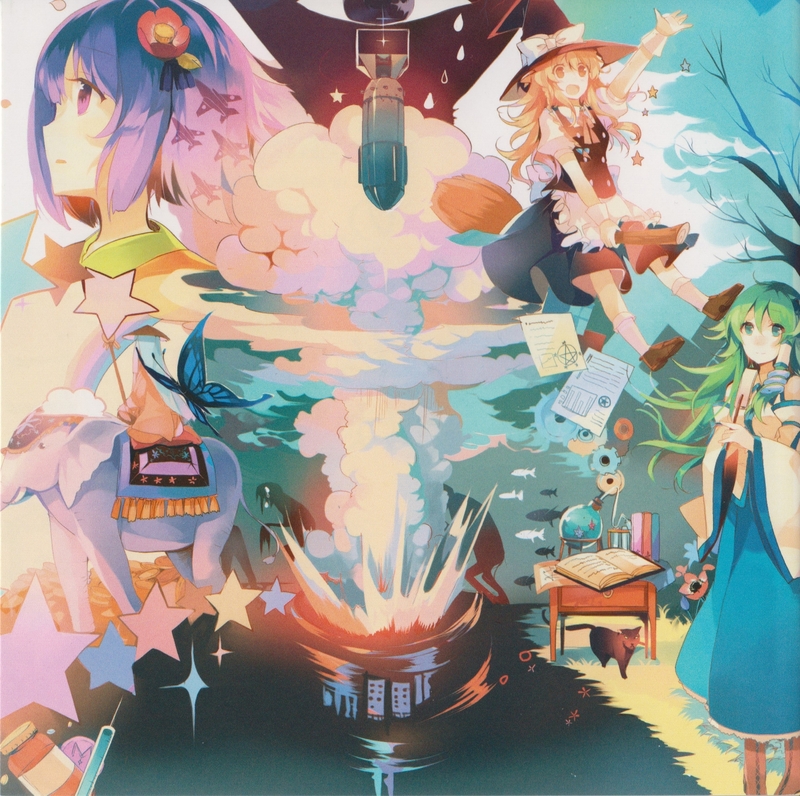 It’s the firework of dreams that will link youkai and humans. With this, the boundary that separates us will disappear! Look, this is the flame of the Second Sun, which will tie the worlds together! “That’s not bad, but aren’t you being a bit hasty? “The inventions that you think up are quite amazing. Let’s combine our strength and knowledge and bring about the Second Dawn! So everyone can live freely! I don’t know why, but I just had an image of the album art as a film poster with ‘Meramipop is… Nitori!’ in big letters at the bottom. Putting that aside, the title of this section is different in the lyrics booklet. In the booklet, it’s かみ合った歯車 (‘kamiatta haguruma’ – Enmeshed Gears). Well now, it’s another ordinary morning. Hello, hello, hello! The sun’s smiling, too. It’s fine weather for inventing! Why say things like “what can I do?” – Enjoyment comes from actually doing it! Whether they’re massive machines or just small parts! Tick-tock – in the blink of an eye, time goes by. Yes, I can’t leave mysterious things alone! I’ll end up opening those secret locks. I peeked through that undone keyhole… and I looked up at the sky. I’ll take everything apart and understand it! I want to know anything – everything! I’m the inventor of the century… or something like that! Yes, it’s only two lines. But it’s the introduction, so it deserves its own page! Shinra-Bansho delivers once again, providing us with a new musical, in line with their second and fourth albums. The star this time is Nitori, and over the next few weeks, we’ll be following her on her journey. What adventures, and what surprises await our brave kappa? About the title: The version I went with is the version presented on the official website. The lyrics booklet goes with the (slightly plainer) “終わりを知る者” (‘owari wo shiru mono’ – The One Who Knows the End). Also, as I go through the musical, I might go back and change some things. Just putting that out there. I spend my days telling this tale, for eternity.